Krabi (Thai: กระบี่, [krā.bìː]) is the main town in the province of Krabi (thesaban mueang) on the west coast of southern Thailand at the mouth of the Krabi River where it empties in Phang Nga Bay. As of 2010 the town had a population of 52,867. 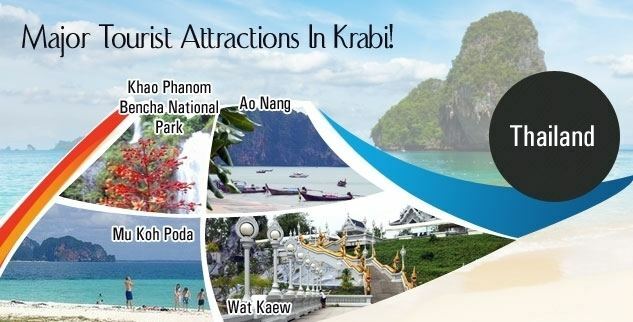 The town is the capital of Krabi Province and Krabi District. Tourism is an important industry. Krabi is 783 km south of Bangkok by road. The town covers the tambon Paknam and Krabi Yai of Krabi district, and is subdivided into 10 communities (chumchon). Krabi is a southern province on Thailand's Andaman seaboard with perhaps the country's oldest history of continued settlement. 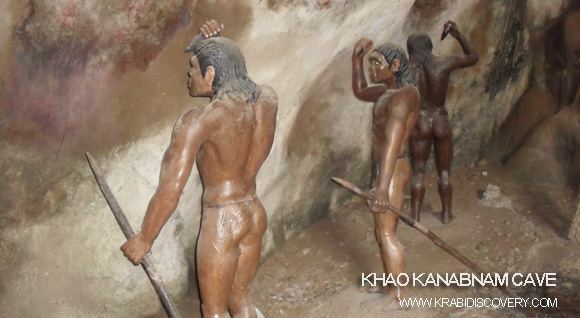 After dating stone tools, ancient colored pictures, beads, pottery, and skeletal remains found in the province's many cliffs and caves, it is thought that Krabi has been home to Homo sapiens since c. 25,000–35,000 BCE. In recorded times it was called the "Ban Thai Samor", and was one of twelve towns that used, before people were widely literate, the monkey for their standard. At that time, c. 1200 CE, Krabi was tributary to the Kingdom of Ligor, a city on the Kra Peninsula's east coast better known today as Nakhon Si Thammarat. Facing the Andaman Sea, like Phuket, Krabi is subject to a six-month rainy season between May and November, often with sustained heavy rains for days at a time during the monsoons. Krabi's highest ever recorded temperature was 39.1° C on 26 March 1998.Its lowest temperature was recorded on 11 January 2009: 15.3° C.
At the start of the Rattanakosin or Bangkok period in the late eighteenth century, when the capital was finally settled at Bangkok, an elephant kraal was established in Krabi by order of Chao Phraya Nakorn (Noi), the governor of Nakhon Si Thammarat, which was by then a part of the Thai Kingdom. He sent his vizier, the Phra Palad, to oversee this task, which was to ensure a regular supply of elephants for the larger town. So many followers immigrated in the steps of the Phra Palad that soon Krabi had a large community in three different boroughs: Pakasai, Khlong Pon, and Pak Lao. In 1872, King Chulalongkorn elevated these to town status, called Krabi, a word that preserves in its meaning the monkey symbolism of the old standard. The town's first governor was Luang Thep Sena, though it continued for a while as a dependency of Nakhon Si Thammarat. This was changed in 1875, when Krabi was raised to a fourth-level town in the old system of Thai government. Administrators then reported directly to the central government in Bangkok, and Krabi's history as an entity separate from other provinces had begun. Ko Lanta National Park, also in Krabi Province, includes several coral-fringed islands with well-known diving sites. The largest island, Ko Lanta Yai, is the site of park headquarters, and is also home to "Chao Le", or sea gypsies, who sustain themselves largely through fishing. The islands are best visited during the drier months of October through April. The rock faces at Railay Beach near Ao Nang have attracted climbers from all over the world and each year are the venue for the Rock and Fire Festival. There are several rock climbing schools at Railay Beach. The rock is limestone and has characteristic pockets, overhangs and faces. Railay has numerous multi-pitch areas most of which start from the beach itself. A famous example is "Humanality". In addition, deep water soloing is popular on the numerous nearby rocky islands accessible by long-tail boat. Since 1999 the town has been served by the international Krabi Airport. Passing through the town is Phetkasem Road (Thailand Route 4).